Hiccup Horrendous Haddock III, more commonly referred to as 'Hiccup,' is the son of the Viking chief, Stoick the Vast. He is thin and somewhat and does not fit the common characteristics of the average Viking boys his age. Because of this, Hiccup struggles to identify with the traditional Viking culture, which at times puts him at odds with his father and other members of their Viking clan. As the assistant of the local blacksmith, Gobber, Hiccup excels in other avenues and exhibits a great sense of inventiveness, creativity, and smarts. What Hiccup lacks in physical strength while in Viking training, he makes up for by being able to interact with dragons, which his clan had been traditionally trained to kill. 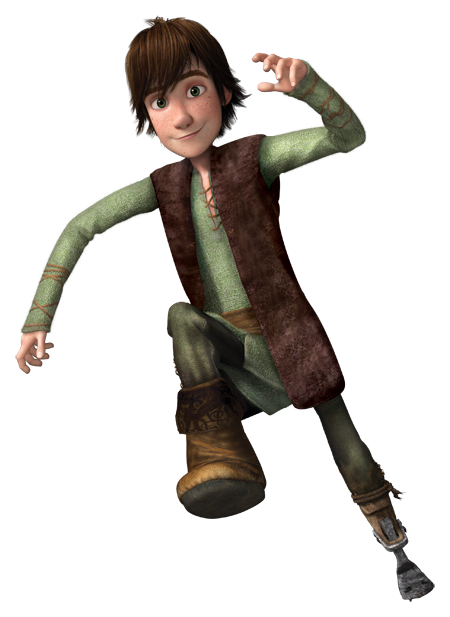 Due to his deep desire to excel as a true Viking, Hiccup often exhibits a strong sense of determination and will go above and beyond what is expected of him, which becomes essential to his role in creating peace between the dragons and the Vikings. It is his steadfast nature that brings him to shoot down the dragon on the night who ultimately becomes his future companion, Toothless. Through his immediate bond with Toothless, Hiccup's new found knowledge of dragons allows him to quickly ride to the top of his class in dragon training. After earning the praise of Gobber, his classmates, and most importantly his father, Hiccup is eventually chosen by Gothi to fight the Monstrous Nightmare. Not wanting to kill the dragon, Hiccup is quickly disowned by his father and ridiculed by the villagers as he tries to explain that the dragons are not as dangerous as they all might think. However, Hiccup is later able to prove everyone wrong during the battle against the Red Death when he gathers his fellow Viking students for training. Hiccup and Toothless ultimately defeat the dragon that had been terrorizing the Vikings' village for a long time. This battle allowed the Vikings to witness the courage and bravery of Hiccup and enter the new world forged by Hiccup and his friendship with dragons.